This was an animated movie that I had not seen yet, despite it being out for several weeks. It is not that I was actively avoiding Smallfoot, but I was having trouble finding a good spot for it to fit into my schedule. There always just seemed to be other movies that I wanted to see more. 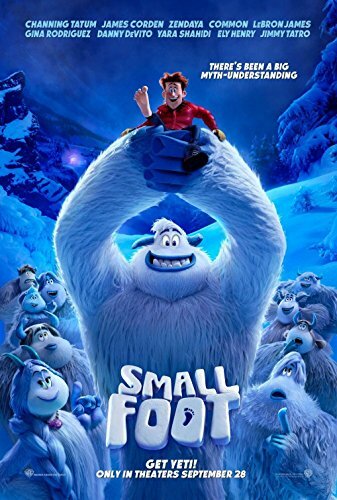 It is not that I had heard negative things about Smallfoot, but it was truly just a scheduling issue. So the last couple of weeks, I was looking to fit it into my schedule and I finally got to see it today. Migo (Channing Tatum) is a young yeti whose goal is to take over as the official gong ringer from his father Dorgle (Danny DeVito). During a round of gong-ringing practice, Migo winds up overshooting the gong and lands elsewhere in the Himalayas. As he was heading back, an airplane, something the isolated yeti had no idea about, crashed, revealing the infamous and long believed to be mythological “smallfoot” aka a human being. The existence of the smallfoot shook Migo’s belief system to the core, as his culture’s ultimate rules, held on by the Stonekeeper (Common) says that there is no such thing as a smallfoot, and if that stone is wrong, then what else might be wrong as well? When he returns to his village, Migo is cast out because of his blasphemous ideas, and he set off on an adventure to find proof of the existence of smallfoot. On that adventure, Migo comes across TV reality show star Percy (James Cordon) and he takes him unwillingly back to his village to prove the stones wrong. Smallfoot is fine. There are some interesting concepts hidden inside the story, in particular the use of the stones as a way to question religion and the way religion demands dedication from its believers. And the film does not make it so obvious that you feel preached at. I’m sure there are some who found that aspect of Smallfoot irritating, but I liked the idea they were going with. It is not developed enough, in my opinion. The animation and voice work here were fine, but there is nothing here that would really make Smallfoot memorable. It seems to be a serviceable film. The songs, however, were all very much dull and unremarkable. With the exception of the Under Pressure (Queen) parody performed by James Cordon, the music of this film is as disposable as can be. I did like how the language barrier between yeti and humans cause a problem. And while the joke got a little stale after awhile, it was nice to see that there were more language problems here than there was between the Americans and Russians in Hunter Killer, which came out this weekend. I am glad I finally got around to seeing Smallfoot, even though it is most likely an animated movie that will settle into the recesses of my brain after a while with little to be remembered for. Still, it is not a bad film to show the children and it has a few intriguing plot ideas that are touched upon.